The following data were gathered from February 27 - March 16, 2015 with a total of 75 female respondents and 16 male respondents for a total 91 respondents. The sign up/survey is ongoing and some of the respondents were given review gift passes from the different review centers that were featured in this blog and our FB page. 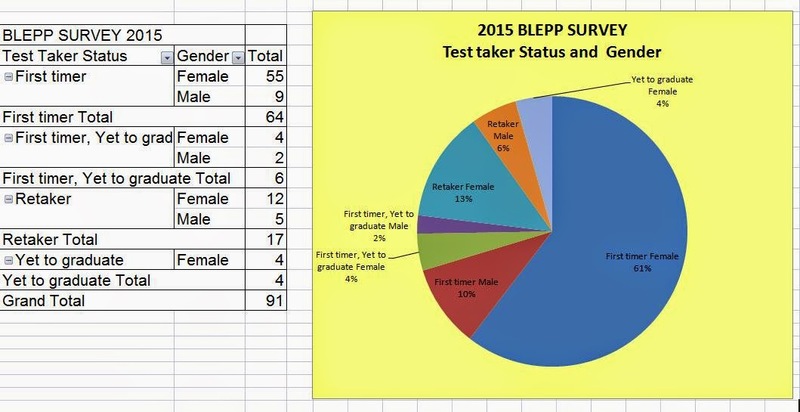 Thanks to all respondents for us to come up with this baseline data for BLEPP 2015. More female first time takers are taking the licensure exam at 61% compared to their male counterpart at 10%. Those yet to graduate some are graduating this year and others in 2016/2017. A total of 20% both male and female will be retaking the licensure exam. Those in the age bracket of 20-22 and mostly females composed 50% or half of the respondents. The rest of the respondents' ages are spread from the youngest age at 17 and the oldest at 38. This data also confirms the age bracket of the majority of respondents. Most of them at 63% have graduated in 2013, 2014 and this year, 2015. The rest at 34% graduated from the year 1997 up to 2012. Data shows that almost half of the respondents are doing self-review at 48%. Although the number of those availing services of review center has also increased as compared to the data last year and some continue to avail online and distance review. 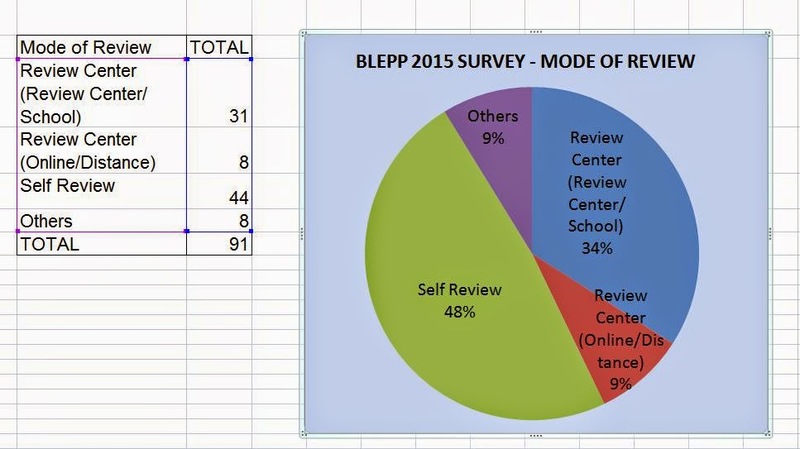 Again this data confirms the preceding or above data, those doing self review responded NA for their review center. Meanwhile, many of the survey respondents are availing the services of SPARK Psychology Review Center. Survey respondents came from 53 different schools or universities. Seven of the respondents came from Polytechnic University of the Philippines (PUP).